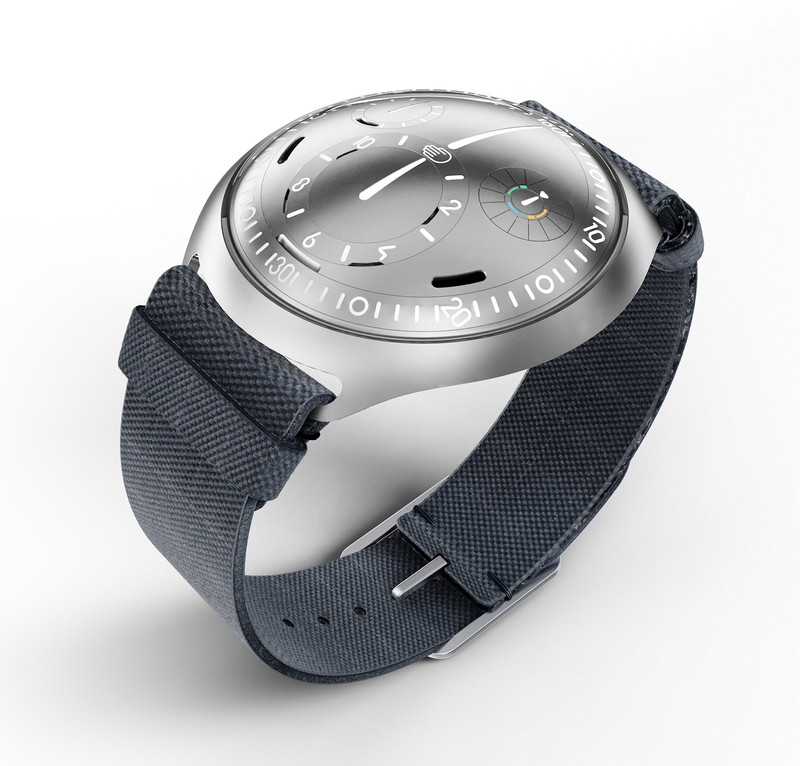 Exhibiting at SIHH for the first time, Ressence has just unveiled the ingenious Type 2 e-Crown Concept. 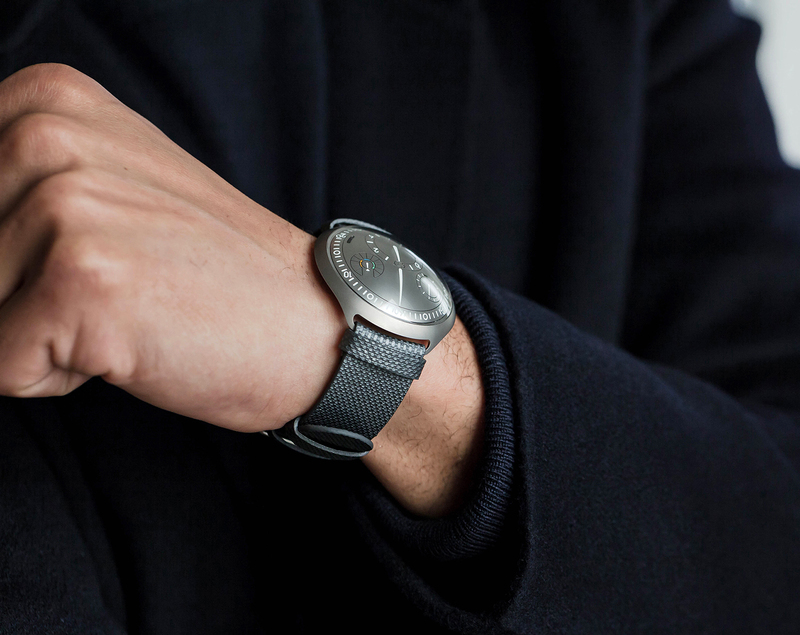 The minimalist watch brand founded in 2010 by Belgian industrial designer Benoit Mintiens combines new and old, with an electro-mechanical addition to a mechanical movement that’s capable of keeping time without manual adjustment. The Type 2 e-Crown Concept uses the same automatic movement as the Type 3 and Type 5 watches, with the electronic setting mechanism being an additional module. 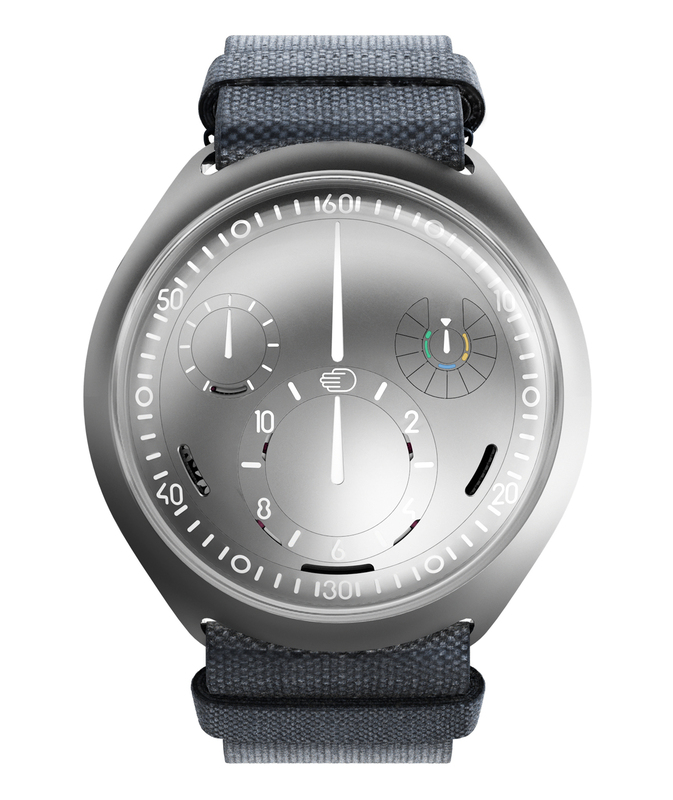 Consequently the time is displayed in signature Ressence style: a nested set of rotating discs showing the time as well as an e-Crown function selector, all driven by planetary gears below the dial. The time display module is proprietary, while the base movement is an ETA automatic. 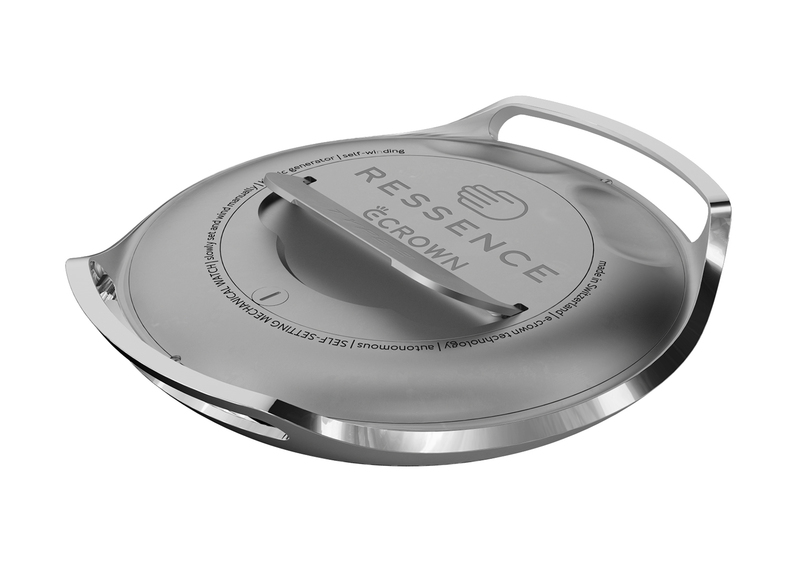 While an ordinary Ressence watch requires a lengthy setting process via the rotating case back each time the watch stops, here it just needs to be set once via the lever on the rear. Comprised of 87 components on a circuit board, the e-Crown system then remembers the time and continues running autonomously without further manual adjustments. It is controlled by simply tapping the crystal of the watch; double tapping awakens the electronic system, which then sets the hands to display the correct time regardless how much time has passed, while a single tap pilots the function selector which is displayed on the sub-disc. Best of all, the watch can operate in three different modes, each indicated by a colour band on the function selector sub-dial: full e-Crown mode where the watch paired with an e-Crown smartphone app via Bluetooth and is accurate to the second, in semi e-Crown mode where the watch is set manually and adjusted to the minute, and in mechanical mode where the watch runs the old fashioned way without any help from the electronic setting mechanism. The e-Crown system is powered by solar cells as well as a “kinetic generator”. Equipped with its own barrel, the kinetic generator is essentially a rotor of sorts that encircles the base movement, generating energy for the electronic mechanism. The solar cells are hidden under 10 micro-shutters located around the selector sub-disc. These shutters are closed when light is not required and open automatically when power is low. 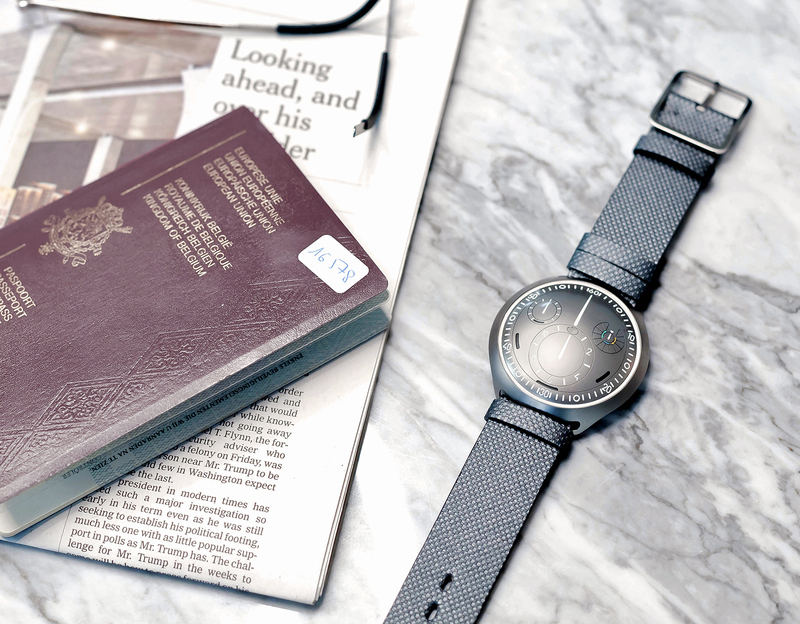 The watch can also display two time zones, which is set manually via the lever or the accompanying e-Crown app. The app offers a geolocation, a drop-down menu of cities, and switches to daylight savings time automatically. The cherry on the cake is the service interval function: the e-Crown system monitors the accuracy of the watch and notifies the user when the watch is due for servicing.